A recognized leader in early childhood education, Toronto Montessori School was looking for a nature-themed play space to inspire outdoor activity for up to 60 children in the JK/SK age group. The school wanted a design that fostered physical, cognitive, imaginative and social development. Our design team proposed Blue Imp’s earthy Rootz series to create the natural look and feel the Montessori school valued. The Butterfly Bluff structure brings nature into the play space with an Ascender Boulder along with Ladybug and Acorn Pods. Wood-look slats create a tree-house feel while Butterfly Post-toppers add a whimsical touch. The Cozy Cabin, complete with Toadstool Seats, continues the nature theme while creating a space for imagination, role play and social interaction. An Off-Roader, large bank of swings and tricycle path imprinted on the rubber surfacing complete the palette of activities. With so many younger children on the go, safety was of paramount concern. Three separate play structures help spread out the action and reduce congestion. Age-specific components and deck heights were carefully selected while concealed areas and crawl tunnels that hinder visibility were avoided. Students and teachers at the Toronto Montessori school are thrilled with this beautiful play space designed to delight and develop this tender young age group. Three nature-inspired structures create an inspiring and spacious play space. 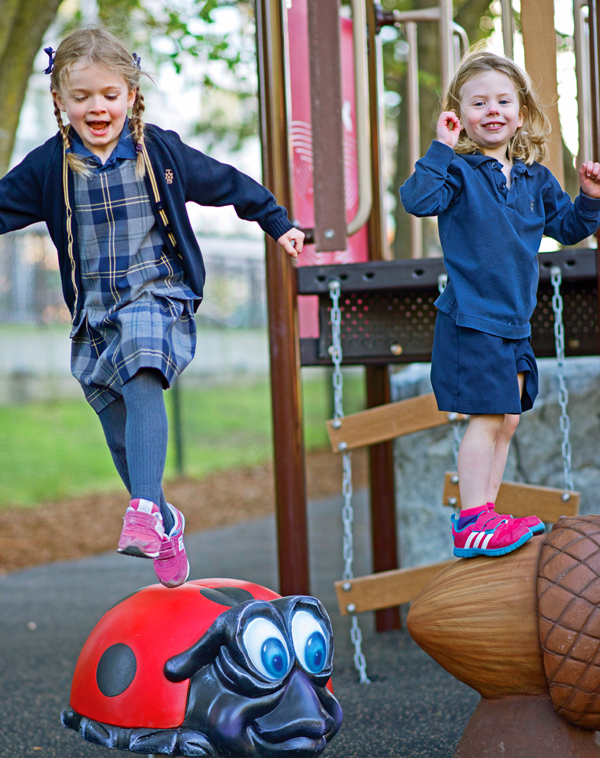 Our wood-look Rootz series brings natural nature-inspired elements to the playground. Age-appropriate climbers provide fun that is challenging yet safe for this age group. Recess is so much fun!